Metal bird house for outside, hand-painted sunflower with bright color. Autumn fall harvest themed backyard decor. Cute outdoor bird house garden decor, with metal wire for easy hanging, looks beautiful on shepherd hook. Country look sunflower birdhouse fall autumn thanksgiving decor, nice addition to your garden. And perfect as a housewarming gift. 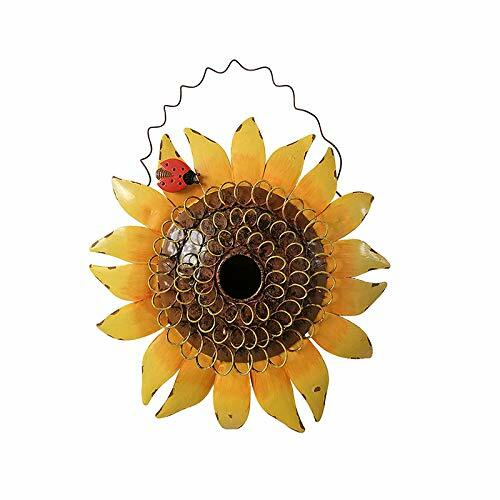 Decorative bird house features vivid sunflower with a small lifelike ladybug on, very adorable. Attached with a metal wire, this small bird house is for hanging on garden wall. Nice decoration for a long fenced in front/back yard or garden. Metal birdhouse size: 12 x 12 x 4 inch, not large but enough to catch guests' attention who come to your patio or yard. Flower bird house is made of metal material, well consructed and the color is last for long. Wonderful gift for any bird or nature lover and perfect addition to your deck or patio.